Olive oil can be used in all cuisines and not just for Mediterranean or Italian dishes. Here's a recipe for Aloo Katli, which can be described as spicy potato rounds. Aloo Katli can be served as a snack or a side dish. The recipe uses mild or light tasting olive oil for its neutral flavor. Add 2 tablespoons of mild or light tasting olive oil to a non-stick pan over high heat. Add the potato rounds, keep them in single layers and shallow-fry for 3 to 3 1/2 minutes. Cover the pan. Remove the potatoes from the oil and put them aside. Add the whole spices to the hot oil in the same pan and push them around a little bit until they crackle (not pop). Add the potatoes back into the hot oil and incorporate them with the oil and spices. Add the ground spices and only cook until they are aromatic because the potatoes are already cooked. 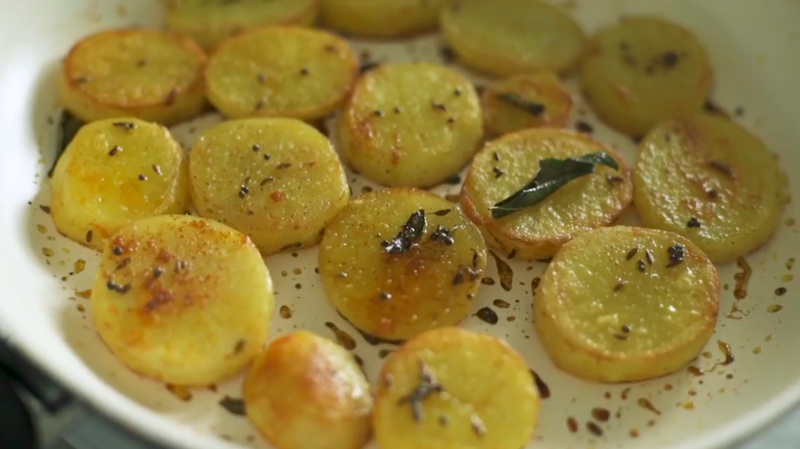 Remove the potatoes from the pan and enjoy! They're best eaten while they're hot and crispy.